One of the most memorable elements in the game were the actors and how they performed with the group. They were magnificent and even though I already played quite a few games with actors, the manner in which you role play with them was unique. One notable sequence involved all participants and it was something that, after almost playing 100 escape rooms, was next level in terms of feeling like I was in a movie. Oh yes, these are the moments that I love and relish as they immerse you into the game like no other. I was lucky enough to be the one who had to execute this sequence and at first had to really think of how I would play out this task. Pretty cool I must say. There were some tangible "aha" puzzles that were extremely fulfilling once you solved them and the group was impressed by their cleverness. We found them clever because they used elements that were actually pretty common in a lot of escape rooms, but in a different way so that you had to clear your mind of preconceived notions of what the solutions could be. There were also a few paper based puzzles but not to the point where it was too much as you typically see at most Real Escape Games rooms. The set design was perfect for what is was, a Victorian style era home. Given that the escape room takes place in the George Brown House, a Canadian National Historic Site, I don't think you can get a better setting for the theme. There aren't any surprising tech elements that will wow you but this doesn't take anything away from our enjoyment and rating this as one the top room that we played in the Toronto area. I wanted more. I wanted more hidden rooms and more cool actor interactions. There was also chaos at the end for the final puzzle because of overcrowding and basically half the group had to stay back and watch so a lower max player count would have been better. 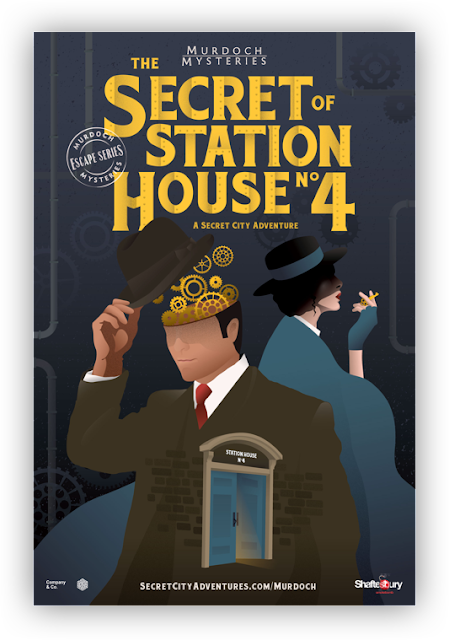 The Secret of Station House No. 4 is a solid room with great actor interaction and clever puzzles. There aren't many crazy reveals and the theme is extremely common but there are a lot of unique elements that make this room stand out from many Toronto area rooms. Even though I feel it would be difficult for your average group to escape, most will make it to the final puzzle which means most will see everything the room has to offer.